Jeremy Faust and Lauren Westafer reveal the new sepsis definitions. Great links to pro/con discussion too by Natalie May and Richard Carden at St Elmyn’s. 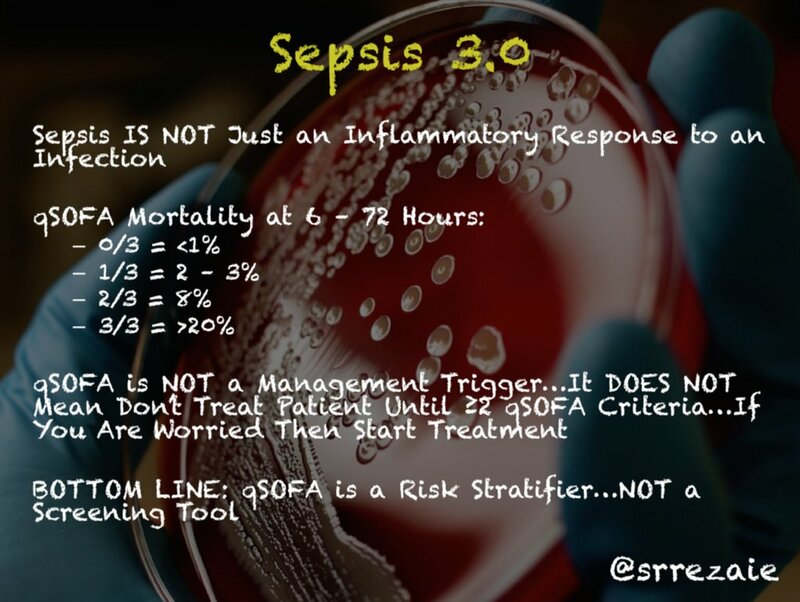 Justin Mandeville also summarises Sepsis 3.0 and uses the “rule of 2s” in his post from ICMWK. And only then, listen to this discussion with Mervyn Singer, lead author of the new definitions. Scott Weingart. Podcast 169 – Sepsis 3.0 with Merv Singer. EMCrit Blog. Published on March 7, 2016. Accessed on April 23rd 2019. Available at [https://emcrit.org/emcrit/sepsis-3/ ]. Grant, Great to hear from you. In anticipation of the new Regs in NYC we looked into peds sepsis. When you discount the baseline chronically ill children from the mix, peds septic shock is exceedingly rare. If you had a case, advanced notification may be a great idea at a non-Peds ED run institution. At childrens’ hospitals, I hope/trust the peds ED docs should be able to handle this as routine care. Great mnemonic! Thanks for clearing up that AND / OR question with lactates. This was a real talking point at our team meeting – confused us but now it it all clear as day. Primary Care needs involvement .We see patients regularly particularly in the nursing homes . There is Pneumonia Cellulitis Urine Infection .Regular review and note of baseline Blood pressure respiratory rate pulse oximetry level and alertness in all its shades is a Primary Care and Nursing care knowledge base . The Ultra early detection Scott is interested in can be derived to an extent from the primary care experience . Also the rate the acceleration into sepsis though it can be thunderclap sudden is interesting . There’s a distinctive and persistent lack of infection biomarkers like presepsin and procalcitonin in these definitions and scores. It feels like the ball is moving more and more into the court of Intensive Care and away from Infectious Diseases and I don’t think that’s the best for the majority of septic patients. In order to calculate a SOFA score, does one now need to obtain an ABG? Would a VBG be sufficient? In your podcast you made several references to your own Triage criteria for early identification of sepsis. Can you expand upon this and discuss what you are using as your triage screen? Great podcast and discussion; please keep it up! 1) The Sepsis 3.0 population looks like a sicker population that the previous SIRS based population. 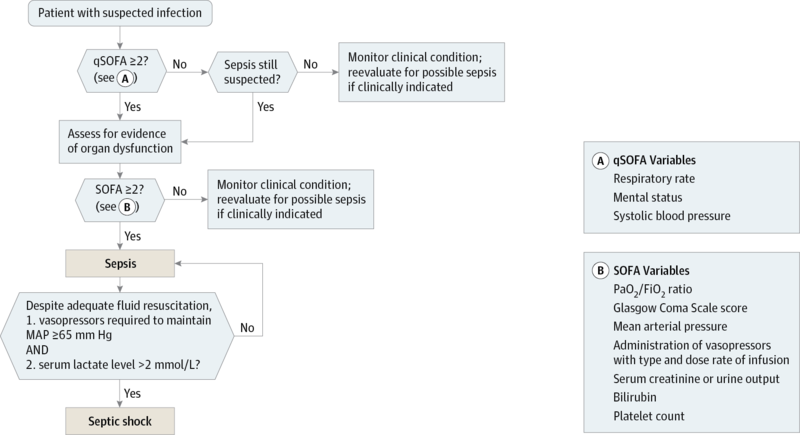 Does that mean we need to re-examine or even redo some of the equivocal sepsis trials? What about sepsis trials where the drug is no longer available or has been withdrawn from the market? 2) Defining Septic shock now requires both vasopressor dependant hypotension AND a persistently elevated lactate despite achieving euvolaemia. The mortality risk for each of vasopressor dependant hypotension and persistently elevated lactate is 18% and 20% respectively, which is greater than that of the qSOFA sepsis defining score of 2 or more (10%). So they are worse than sepsis, but they are not septic shock – fair enough for lactate alone, but what about the hypotension alone; what is this now? I’m sure Mervyn would say to treat the patient in front of you (Fair enough) but I would be concerned that clinical pathways may be developed around the new definitions that potentially under-recognise certain subsets of risk. Thanks for clearing up the issue of qSOFA criteria as a prognostic screen for patients with a suspected infection rather than a diagnostic screen for sepsis. 1. Not aware of any trial using SIRS–they all used SIRs merely to screen for severe/shock, no? So I don’t qSOFA will change them. 2. Reason for the change is that many patients with alactemic hypotension just need a pressor and do great. These pts probably don’t deserve the imprimatur of septic shock. They are sepsis. Sepsis is now a sick patient.